Do I talk to the parents of the child bullying my child? What makes certain children targets for bullies? 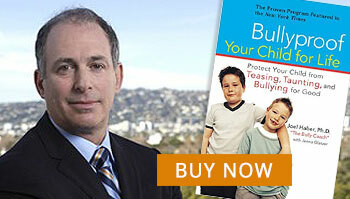 "Bully Coach" Joel Haber, Ph.D., is one of the foremost experts in the prevention of bullying. A pioneer in the field, he has worked with thousands of kids, parents, teachers, counselors, and others to understand the root causes of the bullying dynamic-from identifying bully types to exposing the reasons why kids become bullies, targets, or bystanders-and stamp it out once and for all. Delivering a practical, supportive, and step-by-step "bullyproofing prescription" that yields lasting results for both boys and girls, from grade school through high school, Bullyproof Your Child for Life offers specific action steps to help any child build resilience and confidence, develop compassion and trust, and thrive in school, camp, sports, and beyond. Empowering, instructive, and inspiring, this much needed guide will help parents detect the early signs of bullying and intervene-with lasting results.